Located in Nyeri, Davis Court Nyeri is within a 5-minute drive of Nyeri Golf Course and St. Peter's Anglican Church. Featured amenities include dry cleaning/laundry services, luggage storage, and laundry facilities. Free self parking is available onsite. When you stay at Swahili House in Tiwi, you'll be on the beach and steps from Tiwi Beach. Featured amenities include luggage storage and laundry facilities. Free self parking is available onsite. 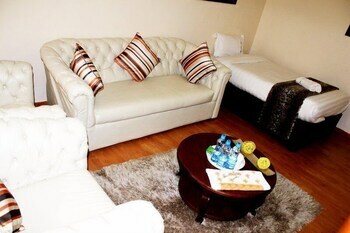 A stay at Acacia Gardens places you in the heart of Nairobi, steps from Nairobi Hospital and close to Kenya Railway Golf Club. Featured amenities include express check-in and a 24-hour front desk. Located in Mombasa, Star Villas is within a 15-minute drive of Voyager Beach and Bamburi Beach. Free self parking is available onsite.